Alright Ya’all. I’m back (kind of) after being part of History in Italy and witnessing efficiency in Switzerland. I’m writing this from Madhura’s (wife) home in France. I was anxious about this nine-day trip to two countries. 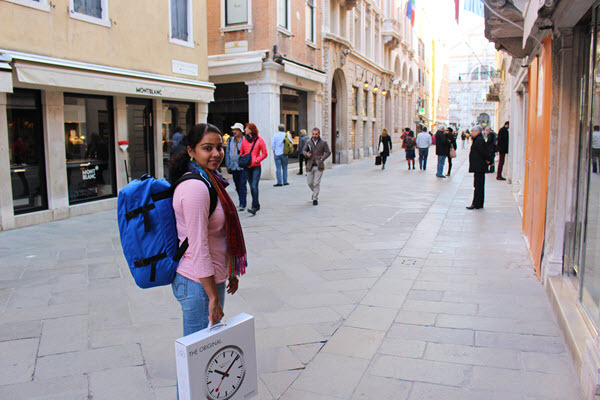 This trip was originally planned for March 2014 and postponed to October, since Madhura could be studying in France. I had planned meticulously for the trip. Several months, days and several hours of research went into planning of this trip. You will know what as you read this first part of our experience. I turned to Rick Steves Best of Europe Guide book to plan for Europe the trip. I Rick Steves in person, got his auto-graph in 2012 at NAFSA Annual Conference in Houston. Read his article on Study Abroad is a Necessity not Luxury. There are so many places to go in Europe. This part took me well over 4 weeks to figure out the countries, cities and places to visit. Initial plan was 11 days covering London, Paris, Swiss and Italy. But, that was hectic plan with not enough time to spend in each city. Then Madhu’s France plan was finalized about studying in France. So, we decided to postpone this trip to October to December. Then second round of planning began. Next part of Europe trip planning was to figure out where to go, what to do and how to optimize the plan. Sunday and Monday are bad days to visit Museum. Plus, combine that with other holidays ( like All Saints Day in Vatican City – Museum will be closed). Then I have to take the travel time, arrival time into account. Since, the cities we were visiting were like maximum 3 hours away, we can’t take the night train. So, we have to travel during early in the morning or late in the evening. Late night train are never a good idea when visiting a new country. You will see why it’s not a good idea later in this series of articles. We were running in no man’s train station in freezing cold, trying to find a platform and train which didn’t exist at that station. Tip : Try to arrive in day light or just after dark, when you are travelling in Europe. Europe can be cheap if you backpack and stay in the Hostel. But, we like to stay in hotels or with Airbnb hosts. So, we were looking to spend atleast $100 per night for the stay. #Florence train is delayed by 25 minutes to Rome. So we wait….. Takes about 1.5 hours in High Speed train to Roma from Florence. But, we wanted the place to be in the right location – Walking distance from the train station or access to Metro Stop. We don’t want to be spending time on commuting to the main city center. Plus, it should in safe part of the town. Hotel in Rome had very good reviews in TripAdvisor, but they gave a room in a nearby hotel. So, we did not have the 4 star experience. So, things will not always go as planned. Back from Top of Europe. Wonderful views. How to travel between cities? How to commute within cities? What trains to take and when to take? When plans change, what happens to tickets? Rail Pass and which pass to buy? When to buy tickets and were to buy tickets? Which is the best seats in the train? How to buy tickets in train station without getting pickpocket? Where to leave the baggage in train station? Research work to figure out the trains in Switzerland alone, it took over 15 hours of work to figure out the travel logistics. Swiss Rail Passes come in different varieties. It’s confusing not easy to make a decision on which Swiss Rail pass to buy. For Switzerland Rail Pass we paid about $550 for 4 days of unlimited travel for two people with discounts for mountain railways. If you get math wrong, you could be spending over $1000 in 3 days of travel in Swiss. I should write another article about Rail Pass for Switzerland. In the end, we got 4 Days Swiss Rail Pass. In Italy we purchased the train tickets on the in the Train Station. This part of the planning involved when to go where. I could have done the entire trip in reverse order ( Rome to Florence to Venice to Milan to Swiss to France). When to leave one city based on hotel check-in time. Buffer time (time to figure out places in new city). When to buy certain train tickets that requires reservation? What if we want to see more places or just fall love with a place and want to spend extra day? Optimizing involves learning about the city, places to visit, how long it takes to visit the places, our interests, time limit. Since, we had to reserve the tickers between two countries, we had flexibility to spend time within the country. Even though we had hotels booked, we’re willing to skip a nights stay. We had this debate in Venice, where we had planned only for a day. In the end, we knew what we wanted to do and learned the tricks from Rick Steves to skip the long ( 2 to 3 hours) lines to enter certain Top Tourists attractions. For instance, line to enter the St.Peter’s church in Vatican city was more than a mile long. We walked straight into the church. No line and no wait times. So, that’s involves read the travel guide. Rick Steves guide book in over 1000 pages. I read about 400 pages of that for the cities we plan to visit. Every travel guide, articles, experiences in the blog talks about Pick Pockets in Europe. Last things we need is have a negative experience in from the trip. Losing money will not only impact your overall feel of the trip, but you have to scramble to call the bank and withdraw money from ATM. If you lose your Passport, then it’s much bigger hassle. So, this was my plan : Keep the cash, Passport, Credit Cards in the Money Belt. I got this Money Belt from Amazon. It gave the piece of mind. It’s a small belt with zip and a pouch that can wrap around the waist. You wear it below your trousers on the waist. Don’t carry anything valuables in your pant back pockets. I downsized to small wallet with 2 compartments ( cash, one card and U.S. driving license ). When possible passport was left at hotel safe deposit box or at hotel lobby. During train travel, I would remove the money belt and leave in above the jeans, but under the jacket or t-shirt. It’s really uncomfortable to sit with money belt under the pants. When I’m not taking photographs with my DSLR camera, I would have it wrapped around the shoulder over the head. So, it can’t be snatched. Walk in well-lit streets even if we have to walk longer. Have phone and wallet in single packet and insert our hands in the packet while on trains. Stand with your back towards the door facing the crowd. Skip a train if it’s really crowded. If train is crowed, face each other in the train, with backpack in front of you. First couple of days, it was kind of getting into my head about this pickpockets. When most of my stuffs are stowed below the pants, maximum I would lose is my phone, one card and some money. I had backup cards, money stored in 2 places. Take all the necessary precautions and enjoy the trip. Trust your instincts. For instance, in Florence we were having gelato on the steps of Duamo. We didn’t feel comfortable sitting with 2 guys who kinds stalked us for sometime. So, we decided to leave the place. They maybe just tourist. Better to trust your instincts than feeling sorry later. Travelling in USA was so different from backpacking in Europe. In U.S. we board the flight with one or two suitcase. Rent a car in the destination, load the car with the suitcase, check in the hotel. Take a day backpack for sight-seeing. So, travelling around Europe with a suitcase is a hassle. Best solution was to travel with just one backpack per person. Regular backpack that we use for school will not help in this case. After doing research for several days, I found Cabin Zero Bags. They are awesome. It’s expensive and takes about 3 weeks to get the order delivered in U.S.A. In Venice. Bright and Beautiful Day. Cabin Zero Back Pack and Swiss Railway Clock. We got two Cabin Zero Backpacks. Packing Cubes were awesome. It’s must have for any trip – Domestic or International. It saved so much space and we packed efficiently. Remember this – Millions of people live in the places you are visiting. So, you are going to get pretty much anything that you don’t take with you – clothes, underwear, personal hygiene products. But, we made sure we take the necessary items and wash the clothes in the apartment in Florence ( mid way in the trip). Plus, leave some place to buy souvenirs ( see what Madhu is hold in her hands in the above picture). We really wanted to buy something memorable from this trip and we did get something big. It was totally unplanned, but we will remember it for rest of the life. It was a bit of challenge to carry this official Swiss railway clock. The Clock made it from Swiss to Italy to France. I have to take it from France to USA. Layout all the clothes you plan to take on the bed. Cut them by half. Take only half of what you planned to take. Simple Rule right. It may sound crazy. But, try that for a trip and see how it works. I had 2 jeans, 2 pants, 8-tshirts, 2 night wear, 5 socks. I ended up taking 2 jeans, one night shorts, 5 T-shirts and 3 socks. Travel light, you will have better your experience with your trip. So, this concludes the part of backpacking in Europe. Next part of this article will be our Day 1 and Day 2 experience. I initially started writing about our travel experience, then added this planning part while editing. Then this planning part became a long article. Now, you know what it takes to visit Europe. For instance Arnab ( Before You Say America is the Best Country, Read this Indian Student’s Survival Story. WOW. ) is inspired by our trips and he was looking forward to learn how it all went. He stalked me in Instagram ( I posted real-time updates from the trip). We hope that this Europe trip will inspire you to travel, study abroad and explore the world. If you are someone who are inspired form our travel, do leave a comment. Let me know if yo have any questions about backpacking in Europe. I spent several hours of research and I hope this experience will help atleast few with your Europe trip planning. Good article, Raghu..! A mile long queue to enter St. Peter’s? I recently visited Italy and was almost going in and out of St. Peter’s freely, multiple times. Was there some special event on the day you visited Vatican? There were long lines for Vatican Museums though. I have a video of the queue, will post it when I go back to US. you must be lucky with the timing. where else did you go? Yup, might have been the timing. I did a 5 day stopover in Italy on my way to India this year. Visited Rome, Vatican, San Marino, Maranello, Pisa and Florence. I should write a blog soon, just to document it. Awesome. Sure, you can share it here. We didn’t have half a day to cover Pisa. Hello sir I am Dilip Kumar currently pursuing my B.tech in computer science and engineering from KL university, india. i would like to pursue my MS in USA but got confused and panic for applying USA university, because of previous news regarding that 15 students were deported from us back to india and also it was rumour that some university has been announced as a black listed universities. so sir please help me out regarding this rumour.